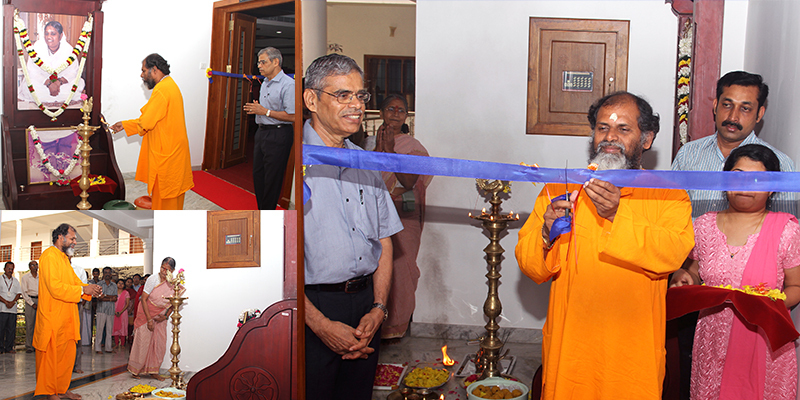 After Abhayamrita Swamy performed the traditional puja, lit the lamp and cut the ribbon at the hall’s entrance, Prof. C. Parameswaran, Director – Corporate & Industry Relations welcomed the gathering comprising Dean-Engineering, Chairpersons, HODs and faculty members from the various Schools and Departments of the University. Stressing on the need to ‘utilize this great facility which truly belongs to the whole university’, Prof. Parameswaran said that this infrastructural investment went on to ‘demonstrate the commitment of the University management’ towards providing the best of facilities to its stakeholders’. The Director initiated a brief presentation on the role of Corporate & Industry Relations that included slides by various vertical heads of the department – Learning & Development, Technical Training & Core Competency, Corporate Training, Corporate Relations, Placements, Entrepreneurship Development, Corporate Communication, Alumni Relations and Advertisement & Visual Publicity. He also formally launched the websites for CIR (www.amritacir.in) and alumni (www.amritians.in).